Well, while working on Frank Jr. I got several headaches on the Audio Implementation, and more specifically in getting it working on all browsers (I mean Safari, Chrome and Opera, as they are the only I really care about), and I wanted here to give some feedback on how I finally achieved it. These tips are based on both my own experience/investigation on this matter, and the information I collected from the internet (based on other people experience). Also, this article does not cover the basics of loading sounds, lots of website are already largely covering the subject (see the links at the end of this article) and also does not cover mobile browser specific "issues" (like iOS, Android). - use the 'canplaythrough' event to ensure you sound is properly loaded (as this event is fired only when the browser determines that it can play through the whole audio without stopping) and don't forget as well to make a call to "removeEventListener" to remove the notification (it might be not needed, but seems to be cleaner this way). - use the 'error' event to be notified on any problem when loading your sound (see next tip). The "audio_channels" being here an array containing a reference to all the Audio Object I created. Isn't life beautiful ? First I know that my mp3 is loaded, and then I don't have to care again about the path, and the event to manage... CloneNode just take care of duplicating the sound on channel 0, and it's just easier that way and working perfectly ! - On some browser when you reach the end of a sound, it's better to force the value of the CurrentTime property to 0. And to give another hint, on Chrome, it's even better to force the value to something different than 0 (like 0.01) as else sometimes the sound is not played. 2. or using a callback, once the "ended" event is fired. I personally prefer the second one, as anyway I use this event in my code to notify me when a sound is fully played. 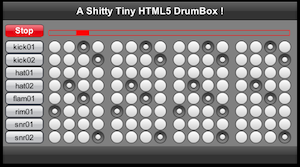 And to finish, I'd like also to share with a very basic drumbox of course fully implemented in HMTL5 using the Audio Element. The used samples are not so terrific, and the loop algorithm (to play them) is not correct, but it was not the point here. Forget about IE, and be sure you have both last version of Chrome & FF. Nice technique. For all of the audio techniques thus far, this looks like the cleanest. Should I just wait, or live for the moment? I think you should live the moment ! but it mostly depends with what you want your game API to be compatible with ? Future browser version? or do you also want the existing ones to be working ? Also, I think my implementation is quite future proof, as I don't see any reason why it should not work with any browser enhancement on the audio.